Discussing the latest sports news. The explicit word that Corso said can be heard in the video below the article. Just like he does every Saturday on ESPN’s College GameDay, Lee Corso chooses the team he thinks is going to win by putting on that team’s mascot head. However this Saturday on College GameDay from the University of Houston campus went a little differently. After guest picker Carl Lewis chose the Cougars, Corso said, “Carl, how can you pick against SMU? Look at them over there, red, white and blue. U-S-A, U-S-A.” Corso then reached under the desk and picked up an SMU megaphone. It appeared that he was choosing the SMU Mustangs until he made a dramatic switch. Just as Corso was about to speak into the SMU megaphone, he then tossed it over the desk and said “Ah (bleep) it,” and then put on the Shasta, the University of Houston’s mascot head. The word that Corso said can be watched in the video below. After hearing Corso’s remarks analyst Kirk Herbstreit who was on the left of him leaned back in his chair and grinned in shock like a young boy that heard a bad word. As for host Chris Fowler, he doubled over with laughter as he slowly put his head down on the desk. As for guest picker Carl Lewis, he just laughed hysterically while clapping and for the fans outside the University of Houston’s campus; they cheered in joy. After gaining their composure Fowler turned to Corso and jokingly said “Shasta, shame on you,” Fowler said. “Wash that mouth out.” Fowler then shook hands with guest picker Carl Lewis and Herbstreit remained lightly punching the mouth of the mascot head as the remaining credits came on, marking the show over. 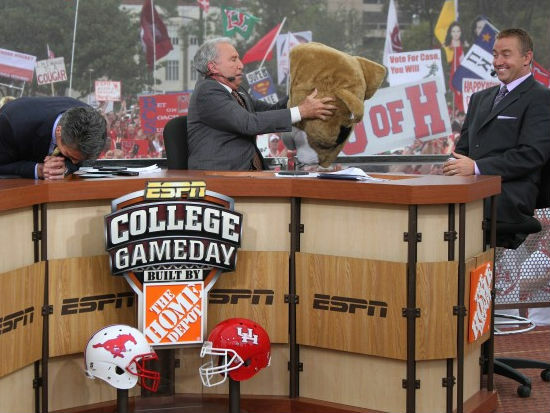 It was the first time ever that College GameDay traveled to the University of Houston’s campus and Corso will make that first time be remembered for a long time. Should the NCAA start paying these athletes? The National Collegiate Athletic Association known to most as the NCAA is one of the most respected association’s in all of sports. But what if you knew that this “great association” was enslaving human beings? What would you think then? Last Year the NCAA paid each team that participated in one of the BCS bowl games money. These amounts shown are the amounts that each team made from the bowl game. So after the NCAA pays these teams and their conferences roughly $85 million they take home $43 million themselves. Not a bad pay check. Now you may or may not think that’s a lot but that’s just the money the NCAA makes off of the bowl games, imagine what they make off the whole entire season? Let’s not even go there. In addition to that, there’s more. 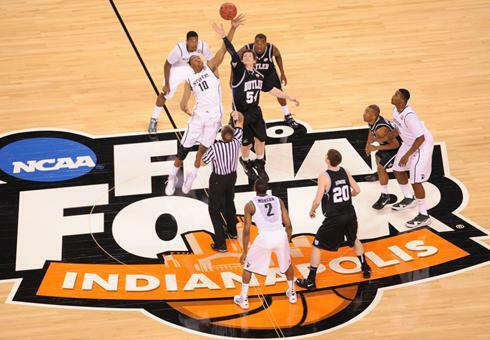 For the NCAA Men’s Basketball tournament the NCAA last year made $771 million. As for the 68 teams and the roughly 1000 athletes that brought them that money, guess how much they saw? Zero dollars and zero cents. The NCAA’s response to this, they give those athletes scholarships. A study at USA today showed that the value of a men’s basketball scholarship adds up to about $120,000. Now compare that $120,000 to the $120 million or so that a student can help make for his school, and tell me if that’s an equal tradeoff. Not to mention that these scholarships aren’t one, guaranteed, second, aren’t given to every athlete on the team and lastly, sometimes there not even given the full scholarship. These scholarships aren’t the greatest thing as you have to work hard just to keep them, as you are forced to commit to maintaining the requirements of your four, one-year contracts, such as keeping your GPA up, attending practice, attending classes, etc. So your free time is very limited. But the NCAA feels $120,000 scholarship that doesn’t put food on the table, doesn’t put clothes on your back, doesn’t let you enjoy going out with your friends because you have to wake up for a practice the next morning, all seems fair to them. However they expect them to go to practice every single day, sometimes multiple times a day, get good grades, and perform on the field, court, etc. As a result they sell their jersey, they sell their t-shirts, they sell tickets because fans want to watch that player or players play and in return that player or players get a scholarship and maybe…just maybe…a pat on the back. Now you may say what makes them so special? They should be lucky to have the fortunes of a scholarship. If they want money how come they don’t go out and get a job? Well the answer to that, where’s the time? They have barely enough time to think and you expect them to have a job? Now that deserves two scholarships, right there. As a result to wanting these luxuries such as new clothes, new shoes, a new car, etc. some of these athletes are given these items by family relatives, friends, or the local sub shop owner on the corner of 32nd street. What’s wrong with that right? Nothing really, except the NCAA feels that it’s absolutely unacceptable for this to happen, so unacceptable that they made it a rule. So not only are these athletes helping the NCAA make millions of millions of dollars without seeing a dime of it, but they can’t even receive a gift? What do they have to ask to go to the bathroom too? That’s just ridiculous. Now yes scholarships are very helpful as they pay for an education however they don’t cut it. So paying these athletes money could be an option. But you don’t have to look at it like that. Why don’t they make it an internship? Several Colleges and College students participate in internships and it brings in extra cash as well as other benefits. So what would be wrong with that? Currently in the world today there are over thousands and thousands of internships that are filled with College students so making one for College athletes in their given sport, what’s wrong with that? Now it wouldn’t have to be the amount of money that they would make at the professional level, but it could be a decent amount. You could pay them hourly, by game, by performance, and many other ways. There have even been reports of Universities talking about making a specific sport a major. Wow, so they not only can change the whole culture of College where its learning first then sports after, but they’re thinking about allowing students to study football?! That’s crazy. But they’ll have a rule about a person giving a twenty dollar bill to an athlete. So what did the NCAA have to say in response to all of this? “It is grossly unacceptable and inappropriate to pay players…converting them from students to employees,” said NCAA President Mark Emmert. He is convinced that the NCAA will most likely never budge on their current principles of paying the athletes. Now it’s not like their asking for contracts, four year deals, and a signing bonus, their asking for some spending money and some money to supply themselves with the everyday necessities, such as food and water. Mark Emmert is that really too much to ask? I guess so, because to you it’s not just no, but it’s “grossly unacceptable”. Mr. Emmert do you know what’s grossly unacceptable? These kids…athletes…humans, starving, begging, stealing, and asking for some money to buy food to feed themselves while they go to practice every single day multiple times a day and play in games putting millions of dollars in your back pocket each night and what do they get in return an empty stomach and an empty wallet. Now that to me seems grossly unacceptable.